Salon armchair with upholstered seat and back. Accessories include; hair brush, 2 hair clips, 2 hair curlers, hair dryer and straightening iron. Adjustable height, foot rest flips up and down. Perfect to fit 18 inch dolls of all styles like American Girl. All is made of top quality for years of enjoyment. Chair measures approximately 14 inches high. Not affiliated with American Girl®, Reg. Trademark of American Girl, LLC. 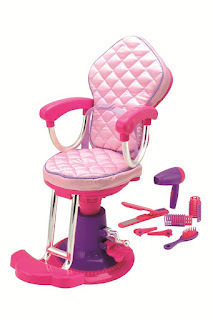 Style your dolls hair with this salon doll chair and accessories. Adjust the seats height and foot rest. Set comes with make-believe hair accessories. Having 2 little girls who have 18" dolls, I was excited to give them this Kid's Doll Salon Chair and Accessories. This salon chair fits perfectly with the popular 18" dolls. It is good quality and easily put together right out of the box. Our girls love to play hair stylist and they get to give their dolls make overs and have a lot of fun doing it in this realistic salon chair for dolls. They love all of the hair accessories that come with the salon chair and like to spend time playing them. I think this kids doll salon chair and accessories makes a great gift for any child who has an 18" doll.